An Englishman, an Irishman and a Welshman travelled from Peterborough to Northern Ireland to compete in Saturday’s deadly serious British and Irish Masters Cross-Country International in Derry. Paul Halford represented Wales in the event for the ninth successive year. 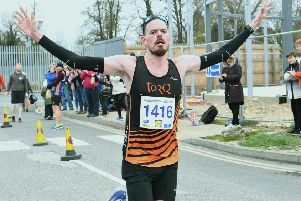 The Werrington Jogger was joined by Peterborough AC’s Phil Martin, who was selected for the England squad for the first time, and Eye’s Tony Gray, who has been representing Northern Ireland for more years than he cares to remember. Although not at his best, finishing down the field in 77 place, Halford was one of the scoring runners for the Welsh team which finished fourth out of the five competing nations. The future looks bright for the Welshman, as at the age of 44 he was running in the Over 35 age group for the final time and, is likely to be a key runner for his country next year when he steps up an age group. Gray will soon be 73, but continues to defy the aging process, as he finished in the middle of the field in the Over 70 race, covering the 6k course in a time of 29:40. Martin was a first reserve for the England Over 35 team and ran in the open race as there were no drop-outs from the England team. This was only Martin’s second cross-country race ever, but he can expect to pull on an England vest again after impressively finishing third in a time of 29:18 over the same 8k course that Halford later completed in 30:10.